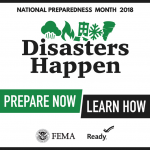 As we gear up for National Preparedness Month in September, it’s time to start thinking about how we can prepare ourselves and our families for disasters and emergencies. Learning lifesaving skills; checking insurance policies for flood, earthquake, and tornado coverage; and taking practical safety steps can make a huge difference in the event of a disaster. The National Library of Medicine (NLM) and other federal government resources listed below can help you prepare your families, communities, institutions for emergency situations. Also, make sure to mark your calendars for our SEAside Webinar on September 6 at 2PM ET: Preparedness and Response for Public Health Emergencies, the Mission of the Assistant Secretary for Preparedness and Response. The HHS emPOWER Map 3.0 gives every public health official, emergency manager, hospital, first responder, electric company, and community member the power to discover the electricity-dependent Medicare population in their state, territory, county, and ZIP Code. The Ready Campaign also offers trainings, webinars, and other resources, including Social Media Preparedness Toolkits.